India managed to cling on to a draw in the fourth and final Sydney Test courtesy some brave batting by Ajinkya Rahane and Bhuvneshwar Kumar as Australia won the series 2-0 at the Sydney Cricket Ground (SCG) here Saturday. India looked well poised in their 349-run chase at tea and raised prospects of an improbable win, batting at 160 for two with opener Murali Vijay (80) and skipper Virat Kohli (46) looking set at the crease. But yet another spectacular collapse saw India surrender that initiative, slumping to 217 for seven from 178 for two, which put the visitors in a precarious position from where Rahane (38 not out) and Bhuvneshwar (20 not out) batted resolutely to save the match for India. 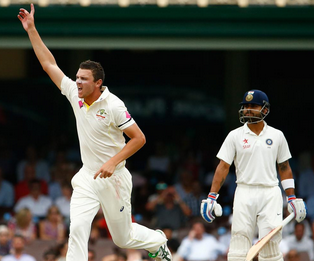 Australia declared at their overnight score of 251/6, setting India a target of 349 runs. Australia skipper Steven Smith, later declared man of the series, knew it would be difficult for India to chase down the target on a wearing fifth day SCG pitch. Indian openers Vijay and Lokesh Rahul (16) looked solid at the crease at the start despite Vijay getting dropped twice. However, Australia did not have to wait long for success as off-spinner Nathan Lyon (two wickets for 110) scalped first innings century maker Rahul, who gloved a turning delivery to backward short leg. Vijay and Rohit Sharma (39) then looked strong in the middle, striking a decent partnership until the latter was caught by Man-of-the-Match Smith, who took a blinder at wide slip, flying to his right and taking a single handed catch. Vijay then consolidated the Indian innings with captain Kohli. Though India were quite respectful towards the pacers, they went after Lyon, who emerged as the most successful bowler of the series with 23 wickets. The 30-year-old Vijay took time to settle down but slowly got into the attacking mode to score his fourth half-century of the series and 10th of his career. His innings was laden with seven boundaries and two magnificent sixes. At 178 for two India looked well on course with two of their most successful batsmen of the series at the crease. This was when the fall started. Kohli presence meant India were still in with a chance despite Vijay’s untimely dismissal. However, Kohli, Suresh Raina (0), Wriddhiman Saha (0) and Ravichandran Ashwin (1) fell within a span of 16 runs, spelling deep trouble for India. With almost 22 overs left in the day and just three wickets more needed, Australia looked set for victory and they pulled all stops to achieve it. However, their onslaught was negated by solid Rahane and Bhuvneshwar, who played out the remaining overs quietly and with one ball left in the day’s play, both sides decided to shake hands.